Cleaning your home and making sure that it is safe from various harmful substances and particles like pet hair is indeed important. By doing this, you can guarantee that you and your family are safe from any unwanted and unexpected health conditions. While different illnesses and diseases are being identified these days, it may be a great choice to use the best possible pieces of equipment that will ensure of a safe environment where you and your family can live in. With the great advancement of technology, it should be easy to find the best pieces you can use to achieve your goals. One of these pieces of equipment includes the new Bissell PowerEdge Pet Hard Floor Vacuum 81L2T. This product is designed and produced using the most advanced technology for cleaning equipment, making it a great choice for everyone in need of them. The innovative Bissell PowerEdge Pet Hard Floor Vacuum 81L2T is basically designed to help people deal with their cleaning issues at home. It is especially useful for people who have respiratory conditions such as asthma, sinusitis and the like. Since sniffing of tiny particles or dirt is not healthy for anybody, it is much unhealthier for those people with certain respiratory diseases. That is why, it is highly recommended to keep your home or any other establishments, where people stay, always clean and free from any harmful substances. This can be achieved through the use of an effective piece of equipment like the feature-rich Bissell PowerEdge Pet Hard Floor Vacuum 81L2T. The new Bissell PowerEdge Pet Hard Floor Vacuum 81L2T comes in a very reasonable price that everyone will certainly love about it. It is fairly simple vacuum stick that is basically designed and marketed by Bissell. This product is quite innovative that it comes with the “V-Shaped” nozzle, which is designed for directing the primary suction area of the unit, whereas the V’s arms allow picking up of the finest particles and dust. The 81L2T features a bagless, corded upright, which is maneuverable, light and fine on harder surfaces. The PowerEdge Pet from Bissell captures debris and dirt, which is normally merely a broom and a dustpan could. This makes it an ideal choice for particular homeowners. 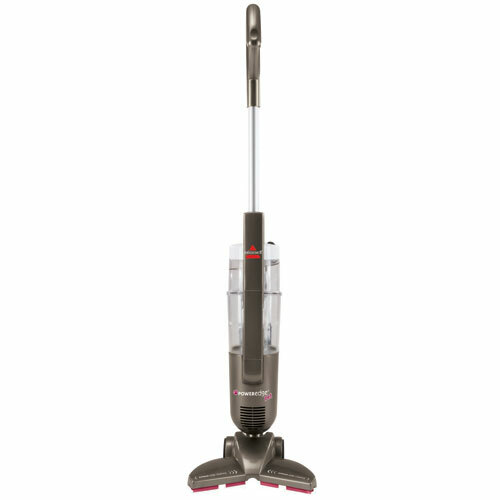 This Bissell PowerEdge Pet Hard Floor Vacuum 81L2T enables effective capturing of debris within tight spaces and along edges with broom or any attachments required. Its V shape is directing bigger debris into the suction path’s center, whereas the ends of the V technology enable capturing of fine, small debris. The vacuum easily cleans around the legs of furniture as well as on area rugs with low pile. It also comes with a swivel head that enables you from easily cleaning of furniture legs. A dirt cup that is easy to empty also allows a breeze cleanup. The equipment comes complemented with the 20 feet power cord for swift and easy cleaning. This product is primarily designed for cleaning a hard floor. Aside from the affordability of this vacuum stick, you will also expect for a number of other benefits from it. The very innovative style is considered as of the best among its features. You may observe that its “V-Shaped” nozzle is positioned on the machine, which makes it much easier to collect bigger pieces of debris that typical forms of vacuum cleaners might unable to do. Even though the nozzle is bigger in size, still, it is capable to pick up small particles as well. With the use of this amazing equipment, there will be no dirt to be left behind. This has been made possible with the swivel motion, which makes it easier to clean all types of floors, not only open spaces such as with certain cleaners. The vacuum is just on the way you wish it to, enabling you to get an access the areas that are hard to reach such as under kitchen tables. Even though the vacuum comes corded, you can still expect of its easy utilization. With the 20-foot cord, this stick vacuum is able to get around just the way you require it to. This Bissell PowerEdge Pet Hard Floor Vacuum 81L2T is known as one of the vacuums with extended cords that you will ever find on such type. The lightweight, small design of this vacuum guarantees anybody could move it around easily from an area to another. It weight is only around seven pounds. Therefore, there is no reason for you to feel lazy for moving it around. It moves well during the time of cleaning, enabling it to work both on carpet and hard surfaces. One of the common complaints of most customers using this vacuum stick is its loudness. It may be a bit loud that lets you think of it as a drawback on the product. In addition to this, the power cord might also be quite short that you may need to use extension wire. However, other than these, there are no other issues you can find around this product, as it indeed comes with great features that you can ever get from a stick vacuum. Another reason for the greatness of its V-shape design is that it helps in ensuring of maximum suction power. You can make sure that even dirt and pet hair in the ground will be removed from your home using with just a single floor vacuuming. 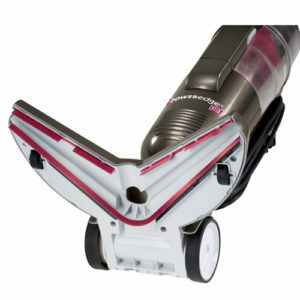 What’s more, the design of this vacuum also enables simple cleaning against baseboards and walls. For the price that Bissell PowerEdge Pet Hard Floor Vacuum 81L2T comes, there may no other vacuum cleaner that might be better than it when it comes to effective picking up of pet hair. You will surely feel amazed about it. 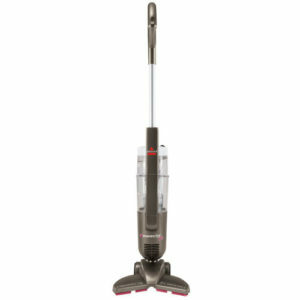 In fact, you might not even notice that you have a pet in the home once you have cleaned it using this Bissell. Therefore, what else are you waiting for? Secure clean your home with this amazing product now!